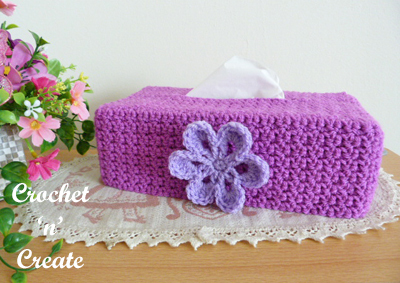 A crochet tissue box cover uk format – Tissues have a multitude of uses from drying your eyes, wiping your little one’s hands, removing makeup and oh of course wiping your nose. Dress up your tissues with this crochet tissue box cover, they can be placed anywhere in the house, crochet in colours to match your room. 2nd Row – 1ch, 1dc into base of 1ch, * miss 1dc, 2dc into next dc, * rpt from * to * to last dc, 1dc into last dc. Turn. Rpt 2nd Row until 10 rows have been worked in all. Turn. Opening – 1ch, 1dc into base of 1ch, * miss 1dc, 2dc into next dc, * rpt from * to * 3 more times, make 22ch, miss 23 dc, 2dc into next dc, rpt from * to * to last dc, 1dc into last dc. Turn. Rpt 2nd Row until 21 rows have been worked from beginning. Sides – Working into row ends down first side, work 1dc into first row end, * miss 1 row end, 2dc into next row end, * rpt from * to * along, work 2dc into corner, working along starting ch edge (miss 1ch, 2dc into next ch) to end, work 2dc into corner, rpt * to * up the second side, ss to beginning dc. Turn. Next Row – 1ch, 1dc into base of 1ch, * miss 1dc, 2dc into next dc, * rpt * to * around to last dc, miss dc, ss to first dc on beginning of row. Turn. You can add more rows here for a deeper tissue box if you wish. Finishing – Weave in any loose ends of yarn and trim off, attach small flower. The written instructions and pictures for this crochet tissue box cover uk pattern are copyrighted to crochet ‘n’ create © 2018. You are welcome to sell the finished products made from the free crochet tissue box cover uk pattern, I just ask that you use your own pictures and put a link back to crochet ‘n’ create. If you wish to tell your friends and followers about this pattern, please only use a direct link to the pattern page on crochet ‘n’ create. 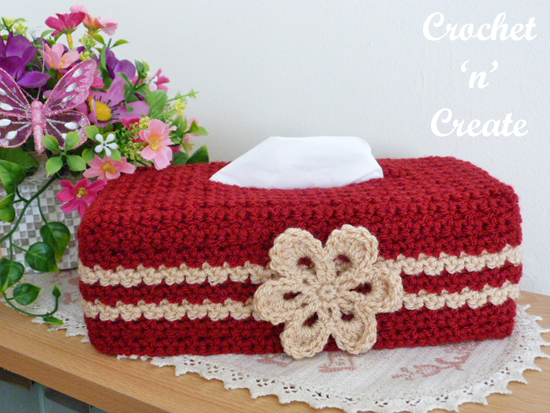 DO NOT share the written instructions for this crochet tissue box cover uk pattern. 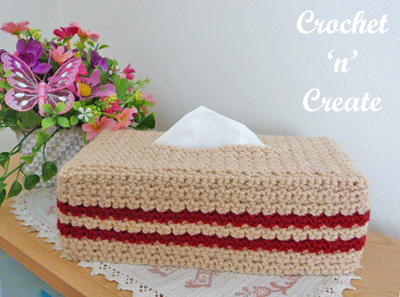 This entry was posted in crochet for the home, Tissue box covers and tagged crochet, crochet for home, crochet tissue box covers, free crochet patterns on 16th June 2018 by crochetncreate.